A C11 two-cell church, now lacking the aisle added in the late C12. 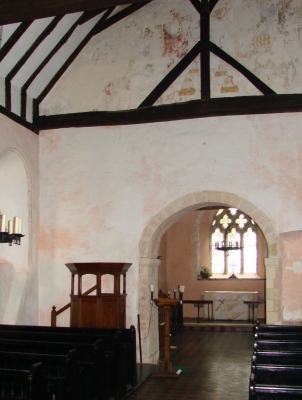 The chancel was extended in the early C14 and there is a fine C17 brick porch. 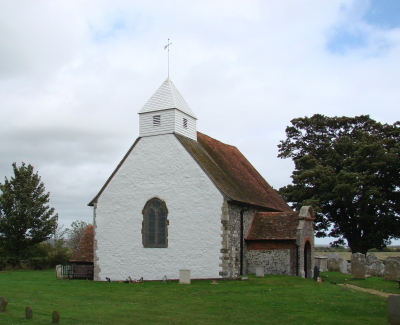 Ford Church stands in a field, surrounded by trees, and is some way from the present village that has given its name to a naval airbase (now a prison) and a railway junction. Foundations of houses visible as undulations under the grass near the church belong to the mediaeval village, which was deserted by 1608 and remains of pagan burials have been found in the churchyard (VCH 5(1) p183). 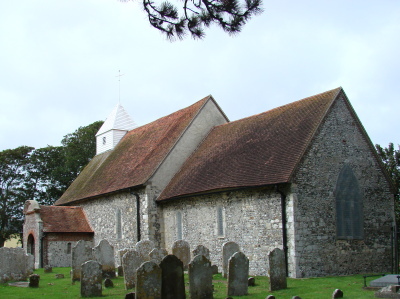 The proportions of the nave are not distinctively tall or narrow, but the north and west walls are only 2ft 6in thick (Fisher p114) and two small north windows have heads formed from single stones, though the eastern one was largely renewed after it was found blocked. Though the sills of the windows are unusually low for this period, taken as a whole these factors point to the later C11. This suggests that the nave is older than the chancel, for its thicker side-walls and relatively broad round-headed chancel arch are unlikely to date from before c1100. The arch is plain except for the partly restored abaci, which are carved with crude stars, a motif found also in St John’s Chapel in the Tower of London (1 p122). The bases of the responds have been exposed, 6in below the present floor level. About 1180 a south aisle was added, with an arcade, probably of two bays, of which the semi-octagonal west respond survives. Round-headed lancets were inserted in the north wall and chancel, including a lowside to the south. A plain pointed doorway reset in the later south wall belongs to the same period. The east wall of the nave south of the chancel arch has been cut away to make space for a nave altar and this could well have been done at the same time. In the early C14 the chancel was extended by 6ft, with a three-light window of reticulated tracery. Unlike the older walls, the new work has no plinth. Some stones in the east wall are recognisably the sills of older windows. The belfry may also have been added or altered, for dendrochronological testing has produced a dating of 1363, though later fire damage makes caution necessary. The fire may have happened about 1400. It affected primarily the nave – the south respond and doorway are reddened. It can only be speculation that this resulted from known French raids (ibid p137), but the aisle probably disappeared afterwards. In addition to the south doorway, a C14 ogee-headed lancet was reset in the south wall – both probably came from the aisle. Following the fire, the only certainly new work was the west window, typical of this date, with a quatrefoil between two uprights. Some roof timbers of the nave have been dated to the second half of the C15 (3 p7), which appears to contradict the VCH’s suggestion (ibid p189) that the fire happened in the early C16; however, there does appear to have been some work to the roof at that time as some nave roof timbers have been dated to c1507-11, again by dendrochronology, including the four-way braced crownposts (3 ibid). Such a date seems very soon after the completion of the previous work unless there had been some further disaster, whether as a result of fire or storm. The pinkish plaster on the walls is probably contemporary with this early C16 work to the roof and probably around the same time, the sill of the north east nave window was cut away for a rood-stair. The chancel roof is obscured by plaster, but the visible timbers look old. 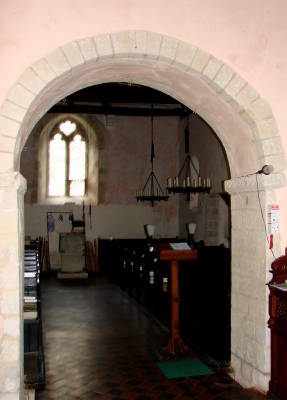 Probably soon after the removal of the aisle, a south porch and a four-centred north doorway were added. The sides of the porch remain, with a segment-headed opening in the east wall. Its front was rebuilt in brick in 1637 with a curved Dutch gable. C18 and C19 drawings show it is unchanged. In 1861 (BN 7 p770) an unknown architect replaced the boarded belfry on the previous lines, re-using some old timbers. In 1865 and 1879 (VCH ibid) the chancel was restored (Peat and Halsted p90 and A K Walker p94), though by 1889 its roof once more needed repair (WSRO Par 87/4/2). However, the major restoration was by P M Johnston in 1899-1900 (CDG 72 (1899) p144), after which he wrote an article in SAC (see 1). The estimated total cost of £500 and a more cautious approach to restoration explain the retention of much old work. The only obvious addition was the vestry north of the nave. By 1997 work was again necessary, particularly to the roof, which was spreading. The repairs by R Meynell also provided for the first time vehicular access (2 p41). Carved stone: (In the vestry above the doorway) Carved with interlaced pattern. The most recent study (Tweddle (ed) p144 (inventory)) calls it C10 to C11 and suggests it has been in this position since the doorway was inserted in the C15. Font: Rough, square and probably as old as the nave. It was replaced in 1865 by a new one and afterwards recovered from a farmyard (Peat and Halsted p88). Font cover: Though not old, this retains the old form with a flat top and a hasp. Glass: ((South nave, first window) M H Minter, 1937 (WSRO Fac). Harmonium: (Chancel) A particularly gross example, made in Chicago in about 1870. Niche: (Chancel north wall) C12 round-headed and possibly intended to house relics. The grooves at the base suggest it was protected by a board. 1. (North nave) A small painted area has been identified as a consecration cross, even as ‘Anglo-Saxon’ in style, but this has been questioned, surely correctly, by David Parsons (3 p6). It is too faint to allow any conclusion about its purpose or date. 2. (South and east nave) Faded. A Doom over the chancel arch can be discerned, with fragments on the south wall, probably of a Passion cycle. Easily recognisable is the Agony in the Garden, with the kneeling figure of Christ and a much smaller one of a sleeping disciple below. Less well preserved is a figure of a man walking with the booted legs of another behind, interpreted by Anne Marshall (www.paintedchurch.org retrieved on 29/4/2013) as Christ being urged along on the way to Calvary by a Roman soldier. Nearby are the remains of two devils, possibly associated with a depiction of the Harrowing of Hell (ibid). Most earlier authorities have dated the paintings to the mid-C15, but Anne Marshall believes they could be C14; David Parsons (3 ibid) suggests that the Doom at least is not older than the early C16. In the south nave window-splay is a figure and some well preserved decorative work. Piscina: (Nave south wall) Plain C12. Recess: (North west corner of the nave) Circular. It was possibly connected with a sounding jar, placed there for acoustic reasons.